Hotjar's Recruiters allow you to recruit your own visitors for user testing. Nothing quite beats spending some one-on-one time with your users / visitors. It might sound like a lot of work – but it's actually quite a fun and extremely insightful experience. The different 'states' a Recruiter can have. Only a fraction of your visitors will be interested in carrying out a user testing session, or they might want to wait a bit longer before they decide. For this reason, they can minimize your Recruiter so it won't distract them. They can expand it later if they wish to and subscribe. A cookie remembers this setting. 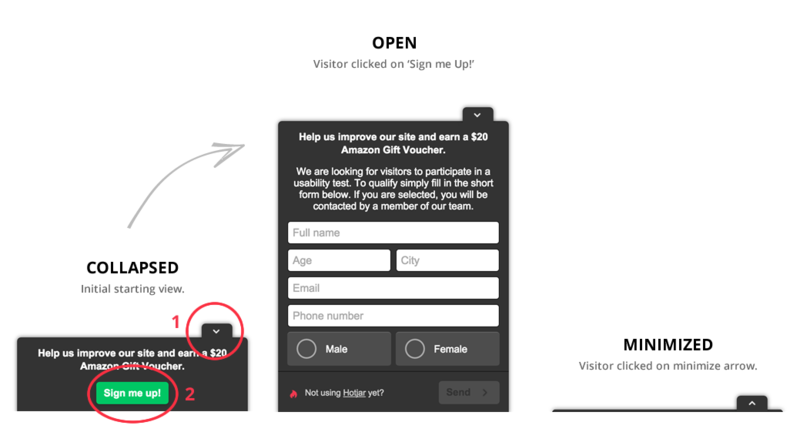 If your visitor is interested in participating in a user testing session, they need to fill in a few details. You can then later decide which of your respondents you wish to contact for the user test. A cookie remembers which Recruiters have been submitted. Hotjar automatically collects the following information about your visitors when they submit a response. Full name, Age, City, Email and Phone number will only be collected if entered by the user.